Amelie's grandfather has taken a long-deserved vacation, and he left her in charge of his historic cafe. But the old site has fallen into disrepair, and it's up to Amelie to bring it back to its former glory. 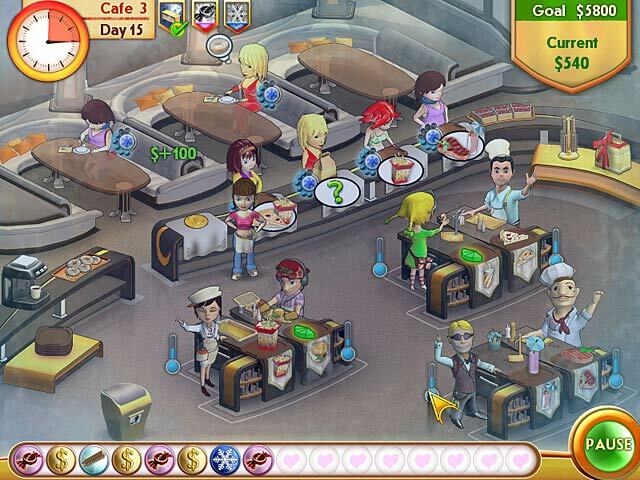 Get ready for a large serving of excitement in this zany Time Management game that will leave you hungry for more! Help Amelie take charge of her granddad's faltering business. Serve everything from solo burger orders to complex combo platters, then set up your powerup bar for a huge payoff! A cast of lovable characters. Amelie's Cafe is rated 3.2 out of 5 by 9. Rated 5 out of 5 by kenya64 from Niiiice! Very Fun and entertaining. Many different tasks going on at the same time. There are also other themed versions of this game. Rated 5 out of 5 by Nikki_Perryman56 from Fun Time Management Game I love the time management games i fully recomend any and everyone to join in and play these games! Rated 4 out of 5 by Aamaretto from Good cafe game. If you like cafe games, you will probably like this. I'm not a big fan of the Diner Dash series because the color matching gets on my nerves, and this has none of this. Instead, your customers are seated automatically and you zoom Amelie around to fulfill their orders. The good thing is that the game gets more difficult as time progresses, but not too difficult that you can't get expert if you try it a few times. There is a lot of things going on (cleaning the tables, asking customers for their orders, delivering their orders, and making your chefs start a new order), so you have to keep Amelie running. The game is repetitive, but most cafe games are. The "ambiance" upgrades seem to make no difference, so I could have done without them, but the cleanliness/speed ones definitely do. This is a well-balanced game. My only complaint is that it's rather short, but then, the developers have put out several follow-ups to fill in the game for those who desire to keep playing. Rated 3 out of 5 by ivanthered from Great game but too short Loved the game, really fast, quite challenging but not stupidly so. I was hooked from the beginning, but that meant I finished it really quickly. Hence only 3 stars - needs more levels, changing the stations to add some variety to continue it a little longer? Only been playing it for a few days, so feel not good value, although such a good game. Rated 3 out of 5 by HeidiDenver from Meh It's ok at first. But nothing changes thru the cafe levels. Same food same boring way to make it. I was bored quickly. Wasn't much of a challenge easy to get the 5 trophies on all levels. There's definitely better games. Rated 3 out of 5 by Tiddleypom from Amelie's Cafe - No Alternative if you get Stuck I was enjoying this but then it just got too darn hard, and there was not alternative to play a relaxed mode, so I gave up and deleted it, even though I had paid for it, I am sure many folk will have no problem but after many attempts, I was not enjoying it any more. Rated 3 out of 5 by bethmt from Not the best While I normally love the TM restaurant games, like Delicious and Diner Dash, this isn't one of my favorites. 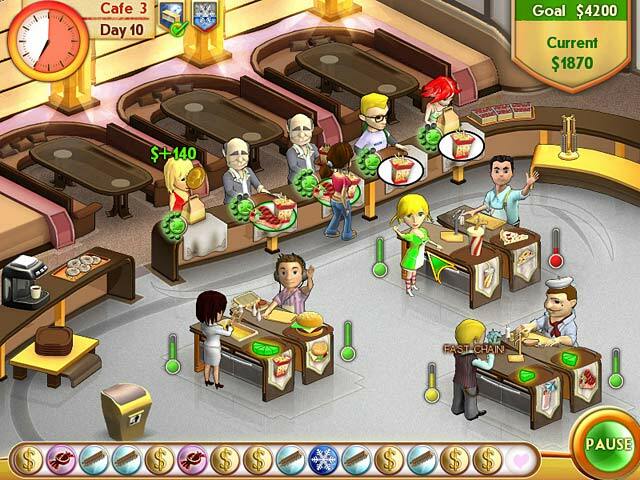 The game itself sounds promising...Amelie takes customer orders, you click on the appropriate food station to fill the order, give customers their food, clean the work stations and perform additional tasks. 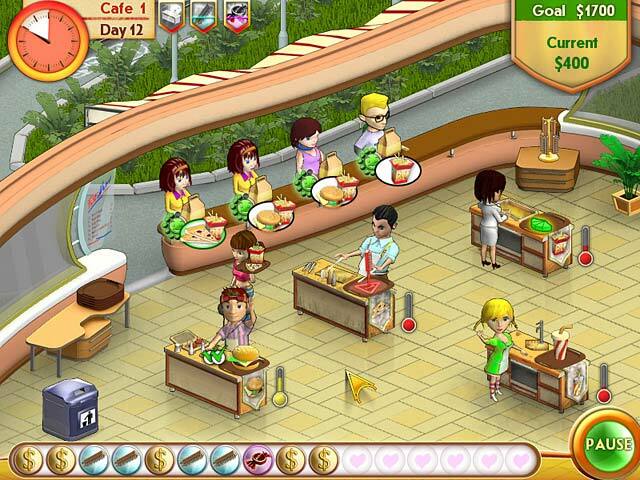 You can also add decorations and upgrades to the restaurant with each level. However, I found the cleaning part to be tedious and annoying after a while; it really slows down the game play. Plus, I feel the game developers added on too many elements in the game's later stages, which makes it kind of frustrating. All in all the game is okay. Rated 2 out of 5 by StarSeeker1043 from Extremely Redundant Same food, over and over and over. Upgrades are few and far between. Workers are WAY too slow. Tired of cleaning the workers' tables when they should be 'programmed' to do it themselves. Blah blah blah, yada yada yada. I'm not happy with myself right now that I paid money for this game, even if it *was* 20% off. It will probably be tossed into my "tired of this game" folder where it will sit for eternity, unless I'm completely bored out of my skull one day and have nothing better to do. Rated 1 out of 5 by marino11 from Don't buy this game! Too many frustrating moments with this game. Not fun at all!